This oversized hobo style handbag is perfect for carrying everything AND the kitchen sink! It has customizable insets (gathered or plain) and handles (with or without hardware). This oversized hobo style handbag is perfect for carrying everything AND the kitchen sink! The Presidio Purse has customizable insets (gathered or plain) and handles (with or without hardware). This pattern is currently available in digital format only. The .pdf includes separate printing layouts for home printing (8.5″x11″/A4 paper) and copy shop printing (A0/wide format paper). For the home print option, the exact pages necessary for each view and option are listed so you only need to print the pages necessary for your view and size. Need help picking a size? Looking for some extra help with the pattern instructions? Want tutorials for creative pattern hacks that further expand what you can do with your pattern? 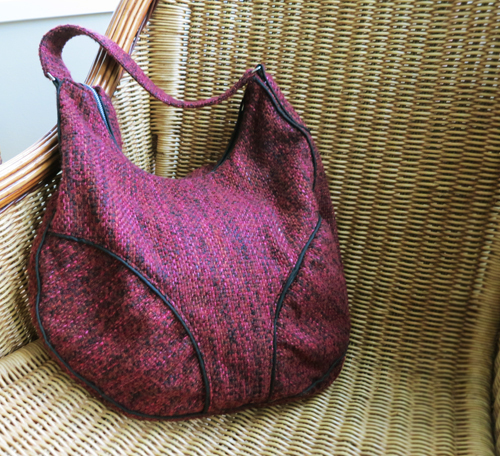 See the Presidio Purse Sewalong page for all this and more! Great pattern, easy to sew with excellent instructions. I will be sewing another soon. Check out http://mysewingsuite.blogspot.com/2014/01/i-made-purse.html for more. This bag is huge! Huge is just what my daughter wanted, of course. It is a great pattern! So many options. Next time I make it, I will definitely use some cording. Great pattern, very versatile. Make it your own by sewing it to carry your books, gym gear, baby’s stuff, as a weekender… you name it. A great bag pattern with great instructions. Every detail has been well thought through and thoroughly tested. You can not fail to be pleased with the pattern or the bag. The bag its self is MASSIVE! You can truly fit everything you could possibly want in here. In our house it’s become known as the ‘Go Bag’. It’s a Tardis. However, it’s still comfortable to throw over your shoulder. There are several choices of detail on the pattern and a million ways that you can customise it to your own look. Nothing could not be more versatile. Go for it! What more can I say? This bag is large enough to carry the sports gear and clothes, yet much more attractive than a gym bag. It has a secure interior pockets for keys and a wallet. Also pockets for pens, pencils and your phone. The perfect bag for that gal who likes to carry a WHOLE LOTTA stuff! The instructions were easy to follow, the illustrations just right. This bag is very functional and so easy to make it your own with different fabrics and notions. It’s whole lotta fun to sew up too! The instructions for this bag are very clear and even non experienced bag makers should be able to successfully sew it. If you want to make a very large bag I think this purse is a very good option. I love this bag! I have used it as a nappy bag, work bag, beach bag, everyday bag and a crafting bag all the space of 3 weeks! It really is a huge bag. The pattern itself is easy to follow and comes together nicely. I highly recommend it! A great bag pattern with lots of professional details. The instructions are clear and very informative. I made up a slouchy, casual gray twill one (here: http://sewwell.wordpress.com/2014/01/02/pattern-testing-the-presidio-purse/) that I plan to use as a carry-all baby bag, and I hope to make another more classy version with faux leather details. A wonderful first pattern from Seamstress Erin. A versatile and practical handbag design with simple instructions and a beginner-friendly sewalong. I’ve been really pleased with my finished bag, and I’ve found the Flikr group full of inspiring versions, that make me keen to try other fabrics/designs/modifications in the future. Love! Love! Love this pattern. Big enough to fit everything I need and on top of it looks amazing!!!! !